During my career as a stress analyst, I have used several commercial Finite Element codes but when it comes to nonlinear analysis, Marc is the solution that really stands out. The complete element library, material models, and robust nonlinear algorithms enable Marc to solve problems from large deformations to material nonlinearity to general contact and coupled analysis. As you may know, the quality of the results from a Finite Element model depends on, among other things, the quality of the mesh. The quality of the elements need to be in good shape in order to produce quality results. When the element formulation is developed, it is assumed that the element has a certain shape. The more you deviate from this idealized shape, the poorer the results will be. 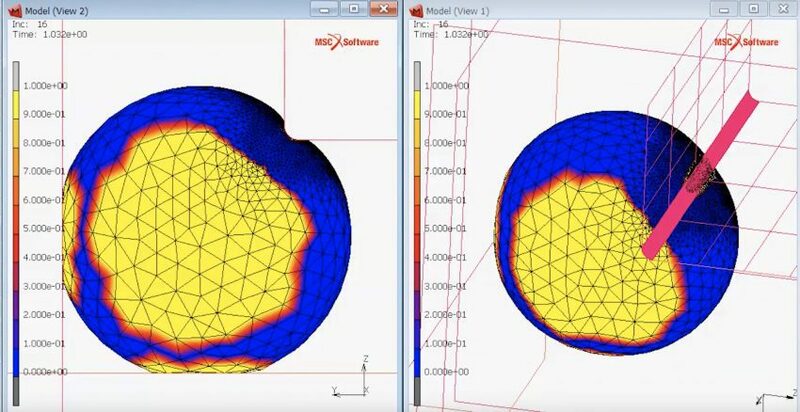 There is a feature in Marc called Global Adaptive Remeshing, where you can have the solver generate a better mesh whenever certain criteria of distortion, strain change, or penetration are met. These criteria are a measure of how distorted your mesh is and Marc will try to generate a new mesh with better quality elements. This capability has been in Marc for many years, both for 2D and 3D models, and we are constantly improving this capability. Global Adaptive Remeshing works on a contact body and the basic control is to define an element edge length that you would apply to the entire contact body. What many people may not know is how much control you have when creating this new mesh. For example, you can define a region within the contact body where the element edge length is smaller or larger. This region can be a box, cylinder or sphere. The region can also be stationary or move with a node, a contact body, or the user can specify how the region moves. The user can also control the mesh density based on their results. For example, the user can define a finer mesh in areas with higher stresses. Global Adaptive Remeshing is a very powerful tool that can be used for very complex nonlinear analysis and it can be used to simulate real behavior of your product.